21st Oct 2016 - Its Showtime! 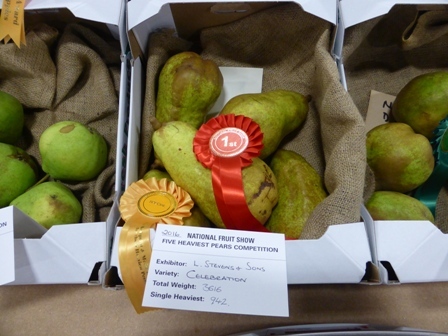 Judging the show fruit takes place on Tuesday and is always a pleasure; the stunning quality of the entries is a joy to behold. The margin between the best entries and the 'chasing pack' is often no more than a mark. Last year the best entry scored 99%. 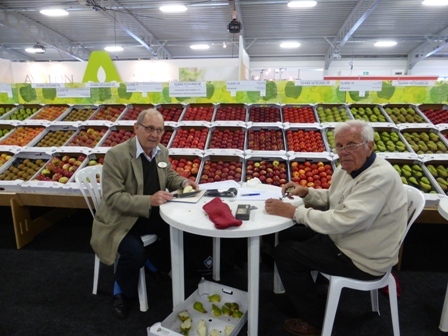 Each year I am paired with my good friend Roger Worraker and fellow judges Tim Biddlecombe and Nigel Jenner, the four of us judge the internal condition of each sample; as we work in pairs we are allowed to take one apple from each sample, test the fruit firmness with a penetrometer and cut each sample looking for any internal disorders. 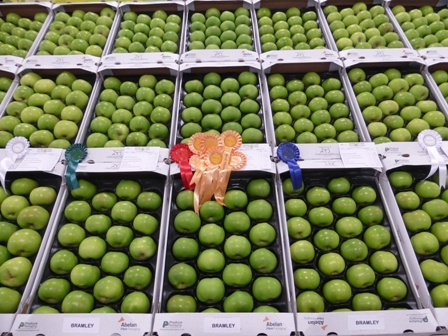 The firmness (we call it fruit pressure) is measured in kg's with a penetrometer and each variety is judged against the commercial requirements of retail customers and any applicable minimum EU standards. 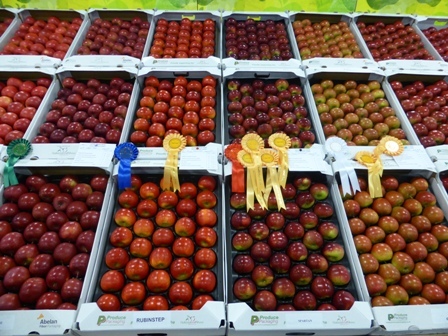 Any fruit not meeting the standards will lose marks on a 'graduating' basis; e.g. a minimal deficiency may result in the loss of half a mark, but more serious deficiencies may result in a loss of one, or maybe two marks. In the Internal Condition category we score out of maximum of 15 marks. 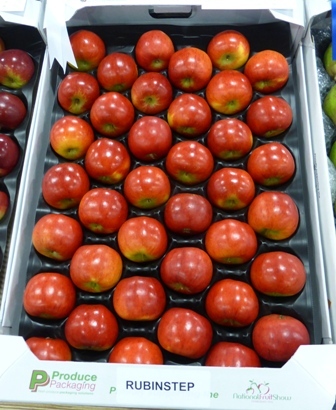 Generally down-marking in this category is most often due to a lack of fruit firmness, although occasionally we find an internal disorder - for example; bitter pit or mouldy core. We also taste each apple and/or pear for any taints. 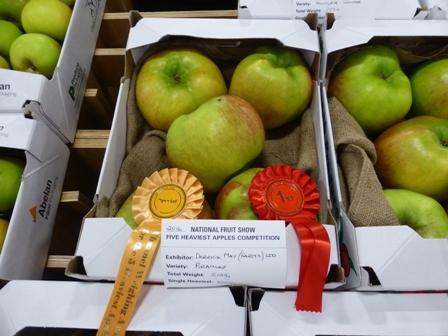 The 2016 National Fruit Show - held at The Kent Event Centre at Kent County Showground, Detling, Maidstone, Kent. 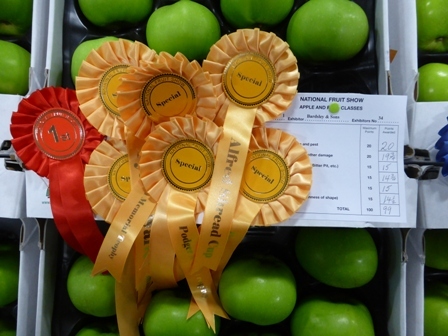 The National Fruit Show opens 'formally' at 10am but prior to the opening, a press conference is held in The Astor Pavilion at 9am attended by 'horticultural industry trade' journalists. 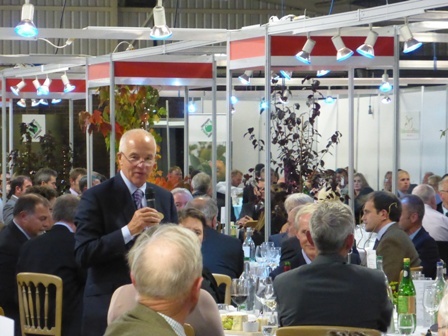 Chaired by National Fruit Show President - Michael Jack CBE with NFS Chair Sarah Calcutt announcing key elements of the press briefing, the Conference was complemented by short presentations by NFU horticulture board chairman - Ali Capper and the new CEO of English Apples and Pears (EAP) - Steven Munday. 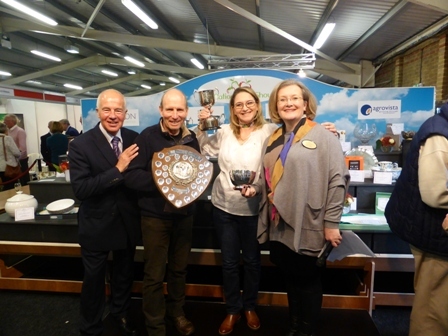 Michael Jack welcomed Ali Capper and Steven Munday to the press conference and marveled at the quality of the show entries, with the 'best in show' (Bramley) scoring 99 out of 100! 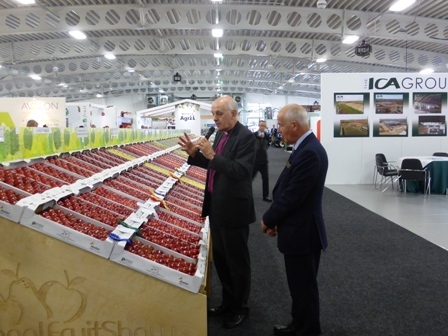 Michael also highlighted the challenges of labour provision after Brexit and the need for sustainable prices; exporting UK apples is now at the trial stage and may be part of the future marketing strategy. 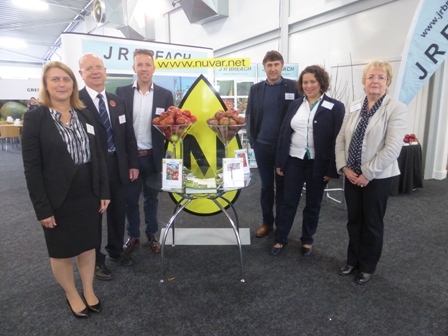 Sarah Calcutt announced the new National Fruit Show web site is 'now live' and will play an important role in modernising the management of the 'fruit show' interactive information flow. 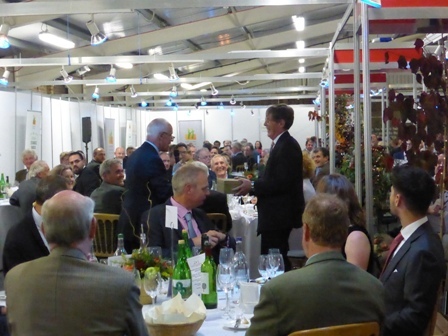 Sarah also said with William Seabrook retiring after 25 years of service as Botden's UK agent and an official handover from William Seabrook to Nick Dunn MD of Frank P Matthews would be taking place at The National Fruit Show. 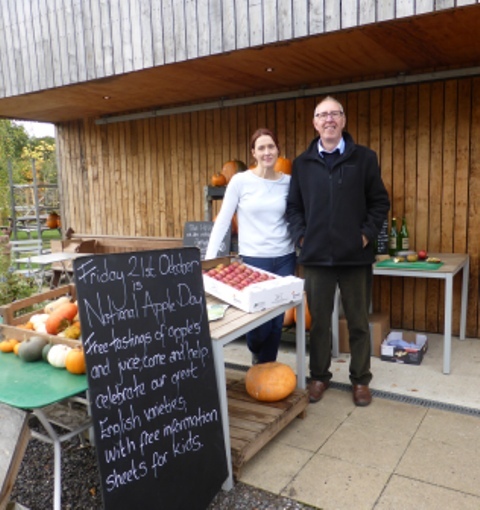 The schools programme 'brilliantly' run by Samantha (Sam) Smith who visits the schools and with her infectious enthusiasm educates children in the delights of apples and apple juice. She has 'to date' educated 5,000 children and a larger programme is planned with increased sponsorship. 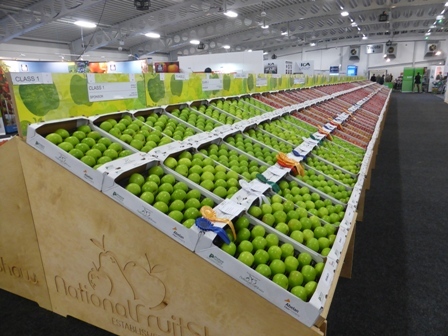 Click on: The National Fruit Show Education Programme for more information. 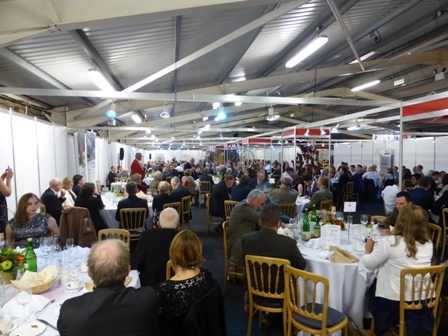 35 exhibitors have entered and the 2016 Bonanza Prize is donated by Wealden AM supplier of steel framed builings for the agriculture & horticulture sectors. 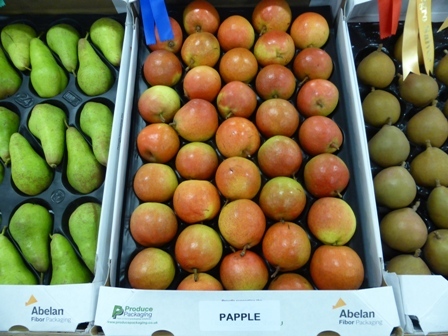 Steven Munday EAP - highlighted an 11% rise in sales of UK apples & pears through Supermarkets. Brexit is a 'hot topic' with so much depending on the continuing availability of labour; we hope labour from outside the EU will be a part of the future. The exchange rate with the £ moving to parity with the Euro will hopefully improve the price back to the growers. Ali Capper NFU - stressed the importance of sorting out the Producer Organisation's (PO's) funding arrangements; currently EU funding supports investment in our industry...how will the funding 'which is a vital element' in investment change? The availability of labour is critical; Ali said the popular belief that without immigrant harvest labour, the jobs would be filled by UK nationals is 'a false dream' - we actually have a shortage of labour in this country with 'high employment' ( UK Government data) - underlining the need for labour from outside the UK as vital element to the future of ours and other sector industries. Ali Capper and her NFU colleagues are working hard to ensure our Horticultural sector is not disadvantage by the Brexit negotiations. 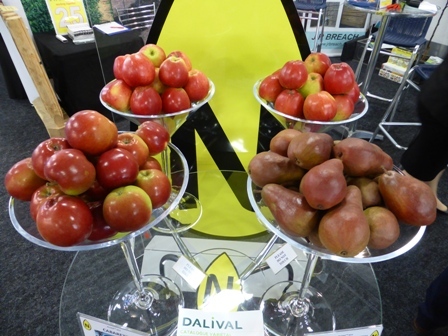 "Following several years of ever increasing 'inadequate financial returns' to growers, there is NO fat in the system; costs will continually be challenged and no doubt some 'cost shavings' may result, but overall the prospect is of more small/medium apple & pear growers 'selling up' (I know of three who have thrown in the tunnel this Autumn) and the future will be dominated by large growers; indeed currently 50% of home grown apples are produced by just four businesses. This is a 'sign of the times' and not exclusive to fruit growing, but without sufficient labour to harvest the fruit even the 'big boys' will find it difficult; nigh impossible to maintain the production levels achieved over the last two decades. 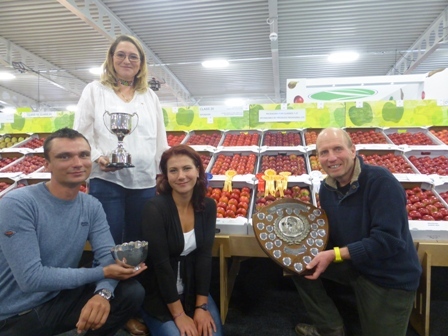 Below: Mole End Organics were prizewinners in 2015 and repeated the feat again at this year's show. 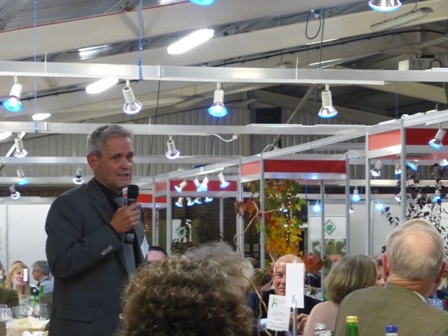 Han ' entertained and educated' the 260 diners; sharing his observations if life and business with his eloquent charm. 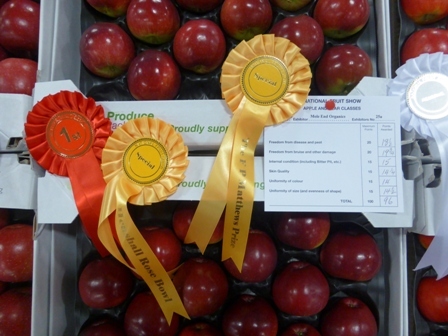 One of the central themes of his speech was how we encourage more consumers to eat more apples and by doing so improve our sales and (x fingers) profits. Han reviewed the standard format for promoting more apple sales; a big poster campaign with the message 'eat more apples' - well nobody takes any notice and the promotion is a waste of money! Fleuren introduced Mini Trees with Hans wife Corine responsible for this separate business, which was founded in 2010 to develop quality trees for the amateur market. These very dwarf trees are suitable for small gardens and pots. From an initial start with a low anticipation of demand, Corine Fleuren told us the response was way beyond expectation. Corine anticipated selling 500 in the first year; that became 5,000! In 2012 Corine's Mini Trees were displayed at Floriade; an international exhibition of flowers and gardening, held every 10 years in the Netherlands.Two million + visitors attended the exhibition and Mini Trees gained much publicity. Demand has increased considerably over the past 4 years and is developing Internationally. Currently there are 'country specific' websites for Holland, Belgium and Germany with UK 'in the planning stage and USA to follow. Sales of Mini Trees are now running at 10,000 a year. 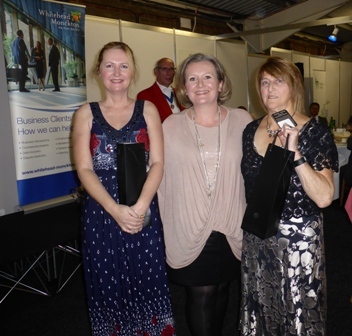 Its never a sure thing when you choose an 'after dinner speaker' but by the laughter and applause it was clear choosing Han Fleuren was a definite winner! My readers will know that I like to share 'eating out' experiences and last Saturday 15th October 'The Old Codgers' dining club (fellow retired colleagues from Home Grown Fruit) met at The George at Molash a multiple winner of Taste of Kent Awards - 'Kent Dining Pub of the Year' - The English Apple Man and his lady frequented the George when we lived in nearby Challock 20 years ago, always a good pint and food, but under new management (15 years) the George has been refurbished and the table layout enhanced, creating the perfect 'ambiance' superb food and excellent service.